Focus on reactions and decision making to try and create a dominant period in the game by providing support up and down the pitch. 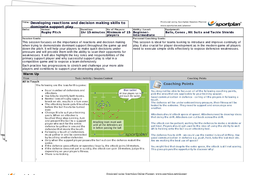 The session works on getting players to offer support by scanning for weaknesses in the opposition defence and making the right decision about when to attack and what skills to use to continue the attack. Start the session with an all-in game of touch to get the players physically warm and switched on mentally. 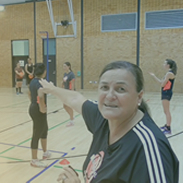 The Skill Development part of the session gives the players the opportunity to develop their decision making skills plus encourages the supporting players to maintain an effective position to offer support when the ball carrier is tackled. The game of Support Touch is followed by a 2v1 drills to fix the defender before passing to a supporting player. This tests the ball carriers decision making as to the timing of the pass and type of pass. Finish with a conditioned full contact game which really emphasises importance of support for the ball carrier. Get your players thinking through the session about the bigger picture. By offering the support, will a scoring opportunity open up for them if they time their runs and passes well? When does the ball carrier need to look to off-load or pass?